Psychological knowledge is ultimately about gaining life skills. Everyone knows what it’s like to be stressed; everyone knows what it’s like to be anxious; everyone knows what it’s like to be down. Unfortunately, not everyone knows how best to manage these problems. Of course, you don’t need to be a suicide risk to suffer from mental health problems. To repeat: everyone knows what it’s like to be stressed and anxious and down. In a recent survey of 20,000 British workers, three in four said they’d experienced symptoms of poor mental health at some point in their lives. In a recent column, I discussed an academic study in New Zealand which found enduring mental health is the exception, not the rule – five in six people experienced mental health problems at some stage of their lives, the study found. There’s not nearly as much misunderstanding and stigma regarding mental health as there used to be, but we still have a long way to go in this regard. Firstly, we need to foster a culture where vulnerability is accepted, where people can casually say: ‘Things have been tough for me lately, I’ve had a lot on my plate and I’m feeling pretty stressed’. Secondly, we need to remember mental health is about more than depression and the likes, in the same way physical health is about more than heart disease and cancer. Just as most people recognise sleep, nutrition and exercise are vital for their everyday physical health, we must all be conscious that the same factors are essential for mental wellbeing. Thirdly, people should know most mental health problems, like most physical ailments, are temporary and treatable. I’m passionate about the value of cognitive behavioural therapy (CBT) in this regard. CBT was pioneered half a century ago by Dr. Aaron Beck. Originally a psychoanalyst, Beck grew frustrated by its methods, believing psychotherapists were relying on untested and inaccurate assumptions. Beck pioneered the development of evidence-based psychological treatments. Originally used to treat depression, user-friendly CBT protocols were then developed to treat various anxiety disorders. Hundreds of scientific trials confirmed the effectiveness of CBT, helping it to become the dominant psychological therapy over the last two decades. CBT researchers continue to innovate, and recent third-wave CBT therapies have incorporated acceptance and mindfulness strategies that boost coping skills and wellbeing. CBT’s rich evidence base means it’s now recommended by the HSE and the National Institute for Health and Clinical Excellence (NICE) in the UK. While increasingly well-known, all too many people are hazy as to how CBT works and how its principles can be applied to their own everyday lives. With this in mind, I’m delighted to have been asked by the progressive and proactive folks in Scannell’s Pharmacy, Ballineen, to give an upcoming talk on the subject of CBT and mental wellbeing. I’ll be talking about the two main psychological techniques underpinning CBT: cognitive restructuring (becoming aware of and challenging habitual negative thought patterns and learning to think in a more helpful, objective fashion) and behavioural activation (identifying helpful and unhelpful behaviours and training oneself to opt for everyday activities that boost mood). We’ll also explore why CBT largely agrees with the stoics, who said people tend to be disturbed not by things but by the views which they take of them (this is a nuanced point, and I’ll explain why it should not be confused with the superficial positive thinking platitudes trotted out in certain self-help books). 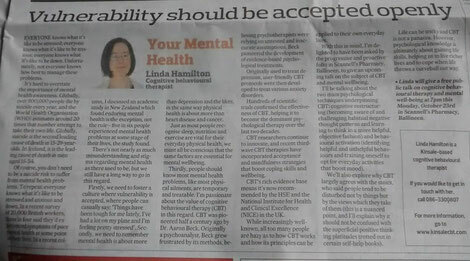 Life can be tricky and CBT is not a panacea. However, psychological knowledge is ultimately about gaining life skills, helping us to live richer lives and to cope when life throws a curveball our way. *Linda’s free public talk on CBT and mental well-being takes place at 7pm on Monday, October 23 in Scannell’s Pharmacy, Ballineen.